(men's M) Ugly Xmas Cardigan! PEARL BEADED snowmen! 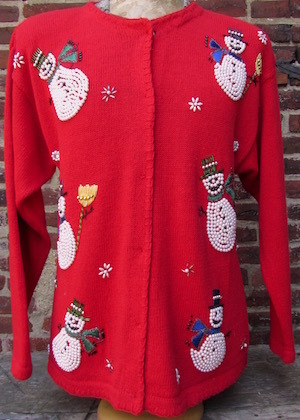 Home > Ugly Christmas Sweaters > mens MED Ugly Christmas Sweaters > (men's M) Ugly Xmas Cardigan! PEARL BEADED snowmen! Ugly Christmas cardigan! 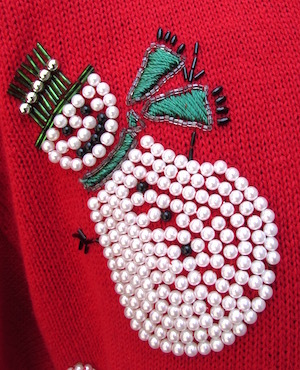 Classic Red sweater with six White snowmen made of pearl-like beads. Snowmen wear beaded hats and scarves in tones of Green and Blue. Beaded snowflake shapes decorate the front of the sweater. Hidden button closure with six clear plastic buttons. Light padding on interior of shoulders that is super easy to take out. Matching red thread-style detailing at collar, cuffs, and hem. Tagged by Victoria Harbour. Ramie/cotton.